Download the FREE 2012 CFN Preseason iMagazine. Go to the app store and download the free Fox Sports Next app for the iPad and click on CFN 2012 Preview. Note: This isn't a ranking of the top pro prospects. Great left tackles are worth their weight in gold, and there’s some thought that an elite one is harder to find than a good quarterback. All the 6-5, 302-pound Jones did was win the Outland Trophy, and now he’s going to switch spots. A brilliant blocker, he helped lead Alabama to the national title by keeping AJ McCarron from getting hit on a regular basis and doing a great job against the better SEC defensive ends. Now he’s going to go from being the best blocker in college football as a left tackle to leading the line as the anchor at center. Versatile, he was also considered a key guard prospect before settling in outside last year. A bad ankle limited him for a bit in the past, but he stayed healthy in 2011 and doesn’t seem to have any issues. 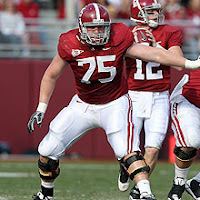 As long as he’s 100%, the Rimington will be his for the taking. The third-year starter is the unquestioned leader of USC's fantastic veteran O-line. Versatile, the 6-4, 305-pound senior can play any position on the interior, beginning his career at guard before emerging as an All-Pac-12 center in 2011. He brings certain intangibles to the middle of the line, such as intelligence and leadership, which the coaching staff covets at the position. Holmes is powerful at the point of attack, yet has the light feet to quickly kick out and get to the second level on running plays. He’ll be in the hunt to be the first center chosen in the 2013 NFL Draft. It’s not like he was a big-time recruit or a special talent coming out of high school, but the 6-4, 328-pounder saw time right away earning the distinction of being the first true freshman in Wisconsin history to start the first game of his career on the line, suffered an ankle injury, redshirted in 2010, and then came back last season to dominate starting 11 times at left guard before stepping in for an injured Peter Konz at center against Penn State and Michigan State in two of the biggest games of the season. With Konz taking off early for the NFL, now the center job is all Frederick’s. If Larsen isn’t the best center in America, he’s in the mix. The 6-4, 308-pound junior is a technician in the middle with a blasting style and enough quickness to make things happen on the move. A starter from his freshman season, he has next level potential both as a guard and as a center, but he’s a special college quarterback for the line. He destroyed the Auburn defensive interior in the opener and he didn’t slow down from there. A big concern at this time last year, the UofL offensive line is hoping to be a team strength in 2012. The Cardinals bring back four starters from last season, led by the rock at the pivot, the 6-4, 300-pound senior, Benavides. A durable leader, who has played through pain, he has earned 34 starts over the course of his career. Having sat out the spring to rehab a shoulder injury, he’ll be ready to assume his role as the physical and emotional leader of this group in the summer.